“This study convincingly demonstrates the need to prioritize pain relief because that is what patients want,” Markman said. After 39 years of treating patients with low back pain I don’t need a study to tell me what patients want. All you have to do is listen to them – what a concept! However, pain and mobility go hand-in-hand. 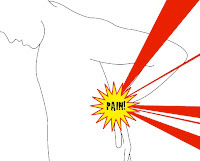 Pain creates protective muscle spasm in the low back that reduces mobility. I think conventional medicine makes a mistake in trying to target one objective over the other. It is typical the the tunnel vision in health care that seeks to isolate health factors and treat them without regard for the whole body. Effective treatment of the low back first requires that any injury reflexes be restored. Second, you must address inflammation, not just pain. Pain is just one aspect of inflammation. Third, any structural misalignment need to be corrected (spinal manipulation). Fourth, the neurological circuits instituting protective spasm need to be reduced. Finally, any adaptive gait mechanisms need to be corrected. Note that spinal manipulation is not performed until inflammation has been addressed. Additionally, protective spasm and gait mechanisms are checked after manipulation. This sequence makes manipulation easier for the patient and they will more likely “hold their adjustment”. We measure both pain and mobility, and typically some improvement in both is noted immediately. However, using nutritional supplementation to reduce inflammation naturally, in lieu of drugs, takes a few days to be effective. This helps me judge which therapy is having the greatest benefit. Of course, the lack of side effects is nice as well. Low back pain and mobility are intimately related. Effective treatment addresses both and the true healer listens to their patients. Thank you!! It is so wonderful to read your thoughts! Western medicine indeed tends to artificially separate the 2 objectives: pain and mobility. Also, as you stated, it has stopped listening to the patient. Third, as a patient, I have felt (for a very long time) that western medicine really doesn't know what to do with back pain and/or injury except medicate it and surgically remedy it. Neither is healing the patient's back or creating a stronger healthier back after problems. As a woman who has been fraught with back pain since 15 years of age (scoliosis, herniation, broken neck and more) ,I have lived pain free for the last 2.5 years (thank you!!) I couldn't agree more with your article and your treatment!! Again, thank you!